If you get the following error: “Windows Resource Protection found corrupt files but was unable to fix some of them. Details are included in the CBS.Log” when running the sfc /scannow command in Windows 10 then you can try the methods on this page to fix the problem. System File Checker is a built-in Windows tool that you can use to scan and repair missing or corrupted system files. If system files are missing or corrupted, then Windows may not behave as expected and some Windows functions may not work, or Windows may crash. You can run this tool with the sfc /scannow command in Windows Command Prompt (Admin). The Deployment Image Servicing and Management (DISM) tool in Windows 8 and 10, can fix component store corruption that prevents the System File Checker from working correctly. We will use this tool to fix our System File Checker problem. I just reinstalled Windows 10, and after installing all of my software, I scanned Windows with the System File Checker tool. Fortunately, I found a solution, and on this page, I will share it with you. The first thing you should try is to (re)boot Windows 10 in “Safe Mode” and then run the sfc /scannow command. 1. Press and hold the [Shift] key on your keyboard. 2. 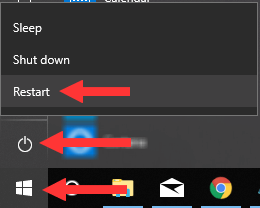 Click on the start menu button. 3. Click on the power button. Note: If you don't see Startup Settings, then you will have to click on See more recovery options located at the bottom of the screen. 8. Click on the Restart button. 9. Choose the Enable Safe Mode option (number 4 keyboard key). 11. Right-click on the start menu button and choose Command Prompt (Admin). 7. Right-click on the start menu button and choose Command Prompt (Admin). 2. Click on the Download tool now button. 3. Open the media creation tool. 4. Click on the Accept button. 5. Select Create installation media (USB flash drive, DVD, or ISO file) for another PC. 7. Make sure that the correct language, edition, and architecture is selected. 11. Select a location on your PC where you want to save the Windows.iso file. The media creation tool will now download the Windows 10 iso file. The download may take a while. The time it takes depends on your Internet connection (speed) and Microsoft's servers. 13. When the download is ready, you will need to unzip (extract) the ISO file with a file archiver program like 7-Zip, WinRar, or WinZip. 14. Open the sources folder of your unzipped (extracted) ISO file. 15. In the sources folder, you will find a install.wim file. Copy this file to your desktop. 16. Create a new folder on your desktop and name it mount. 17. 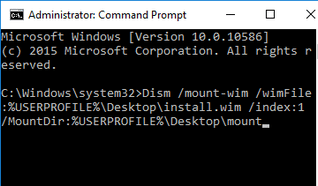 Open Windows Command Prompt as administrator. 18. When the User Account Control (UAC) window appears, you click Yes. Note: You must wait until a command is completed before you run the next command. This may take 5 to 10 minutes, and at 20% it will look like it's stuck (freezes), but that's okay. It's normal. Don't worry. It will work. Just be patient and wait until the command is 100% completed.